"Site is easy to navigate, excellent selection, good description of items. I'm very pleased and will come to this site whenever I am looking for good entertainment and educational DVDs." 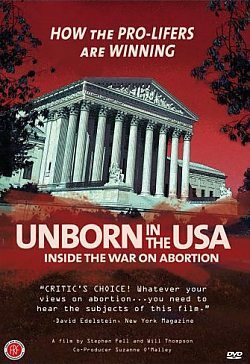 Provocative and bracing, Unborn In The USA provides a riveting look into the deep secrets and deep pockets of the pro-life movement. Traveling across 35 states, the filmmakers are granted unprecedented access to pro-life groups, movement icons, fund-raising machines, and even into classes where university students are being groomed to carry empathetic, pro-life messages to campuses around the country. More than 70 exclusive interviews are interwoven with astonishing archival footage and startling street confrontations to document one of the most controversial social movements in American history. Warning: This film contains some objectionable language and due to the controversial subject matter, there is some violence. Get the Pro-Life DVD Collection or the Pro-Life Documentary Pack and save. My God is always faithful. I personally think it was funny how they showed graphic images of aborted nightmarish fetuses on college campuses and infront of abortion clinics to try to get people to change their minds. unfortunately, is that the way God, not you, would want to get it done? Did they pray about it beforehand? probally not. Here's an example) I love "Hellfire preaching" but to show graphic images of Hell on every corner is slightly too much fire and brimstone. However, this "in your face evangelism" dose convert some, and this movie is worth a watch. If it floats your boat, do it. for. The F word is used in the movie about 10 times.